You can’t visit Vancouver without taking a bike ride somewhere along its world-famous bike routes. Whether you like urban biking or hitting the trails, there’s something for you near the Dunbar neighbourhood. Here are some of our favourite routes. This one is easy: there’s a painted bike lane along Dunbar, which takes you from 16th avenue all the way down to Marine Drive. Dunbar has interesting shopping and great restaurants. 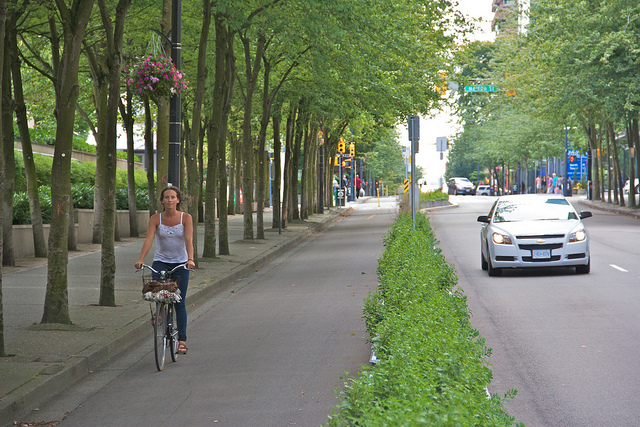 It also leads you to bikeways to other parts of city, either along Marine drive or on 29th or 37th avenues. 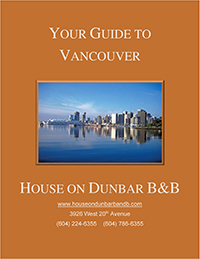 If you follow on 37th avenue, you will reach the Van Dusen Gardens and Queen Elizabeth Park. 29th avenue will also take you to Queen Elizabeth Park. If the woods and trails are more your thing, you’re in luck! We’re very close to Pacific Spirit Park, with plenty of trails to choose from. Taking 29th avenue towards the west will lead you to the entrance of the park. If you take Dunbar north and keep on going through residential streets, you’ll eventually end up on English Bay. The Seaside Trail begins at 3rd Avenue and Wallace Street, and you can keep on riding around Point Grey until you hit famous Wreck Beach. However, be warned that the trail conditions around Wreck Beach can be difficult, so you can ride to Point Grey and turn back. If you take 3rd avenue east instead of west, and then north on Trafalgar, you’ll reach Kitsilano Beach and Vanier Park. Home of the Museum of Vancouver and other attractions, Vanier Park is a great spot to spend an afternoon. You can then keep following the Seawall trail all around False Creek, through Yaletown and the West End and all the way to Stanley Park. Whether you like short rides or long expeditions, you can get anywhere on a bike from the Dunbar neighbourhood!